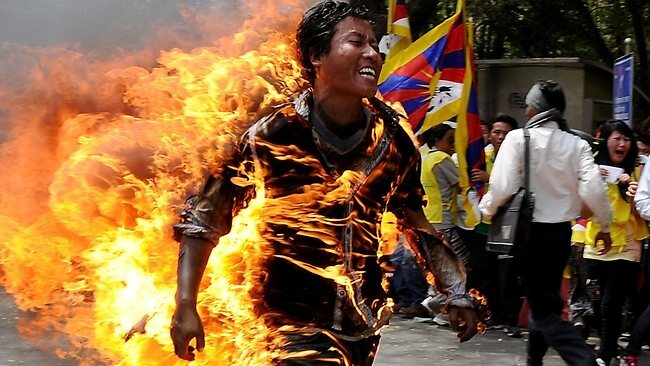 The world press has been mainly silent about the many self-immolations among Tibetans. Some media mentioned it briefly, some speculated about the reasons behind it, assuming for instance it would have to do with “religious fundamentalism” (ZEIT Online), lacking any understanding or deeper insights. It might be due to this undue silence of the world, that the CTA (Tibetan Government in Exile) felt urged to publish their own documentary about it. It’s a real shame that the press failed to pick up this sad tragedy but instead uses time and money to report about ridiculous topics like a “Nazi Buddha from Space“. During the hunger strike of Thubten Ngödrup in 1998, the Dalai Lama expressed his disagreement with this kind of practice, which he considered as violence against oneself. However, he cites often Gandhi, for whom hunger strike was a non-violent act. He expressed his admiration for the courage of these people and attended prayers for them. But he questioned the effectiveness of such actions, he said, [these actions] lead to increased repression. Now he does not want to say anything about this [topic] any more. The first Tibetan who self-immolated was Thupten Ngodup. He set himself on fire on 27th April 1998 after the Indian police came to forcefully stop the “Hunger Strike Unto Death” which was organised by the Tibetan Youth Congress (TYC). After Thupten Ngodup set himself on fire the Dalai Lama visited him next day in the evening at the hospital. Self-Immolation in Context, 1963-2012 (PDF) (html version)– by Michael Biggs (University of Oxford) – which is from the collection of scholarly papers Revue d’Etudes Tibétaines. ¹ Associated Press, March 29 2012. A British monk died in a Tibetan Buddhist monastery in France after he poured petrol over his clothes and set himself alight, police said on Friday. The 38-year-old Briton, whom police did not name, had been living at Nalanda monastery near the southwestern village of Labastide-Saint-Georges for the past five years. He carried out the act on Thursday in the garden of the monastery, which is home to 25 monks and 20 lay people and which on its website describes itself as “a unique monastery for Western monks in the Tibetan Geluk tradition”. Police were seeking to establish whether the victim had been depressed or if he might have committed suicide in an act of solidarity with Tibetans in China. More than 30 people have set themselves on fire in China’s Tibetan-inhabited regions since March last year in protest at what they say is religious and cultural repression by Chinese authorities. Tibetans have long chafed under China’s rule over the vast Tibetan plateau, accusing Beijing of curbing religious freedoms and eroding their culture and language. The tensions have intensified over the past year, but Beijing insists that Tibetans enjoy religious freedom and have benefited from improved living standards brought about by China’s economic expansion. How sad. The monks there are very kind and good. I love them. It are now 70 people (or even more) who self-immolated themselves. I find this a very horrible death. A woman said to be “obsessed” by Buddhist beliefs died after setting fire to herself, an inquest has heard. Helen Tindall, 50, who had a history of mental illness, was found outside her Caernarfon home in January, 2007. A detective told the hearing she had a strong interest in Buddhist beliefs, including the practice by monks of killing themselves by burning. North west Wales coroner Dewi Pritchard Jones recorded a narrative verdict at the inquest in Pwllheli. He said Miss Tindall, who was found in the back yard of her home, died as a result of self immolation – she set fire to herself. It was probable Miss Tindall deliberately set herself on fire, he said, and the fire had burned for a very long time and at an intense heat. DNA samples had to be used to identify her body which had been almost completely destroyed in the fire. Police had called at her home after her mental health worker reported concerns she had not been seen, the inquest heard. Pathologist Dr Brian Rodgers told the inquest that because there was so little of the body left, he could not be certain of the cause of death. But it was most probable that she died as a result of burning, he added. Detective Sergeant Dan Tipton told the inquest that Miss Tindall had a history of mental illness. A search of her house had revealed she was “clearly distressed” in the weeks before her death. She also appeared to be obsessed by Buddhist beliefs, including the practice of some Buddhist monks to kill themselves by burning, he said. Giving a narrative verdict which outlines the circumstances of the death, the coroner said it was “a very unusual case”. The British monk (38 years old) is reported to have been a sane, patient and compassionate person. an immense gratitude to His Holiness for making this distinction clear.” Not clear enough it would seem. Several years ago, HH stated that, under certain circumstances, abortion is permissible, this despite the fact that from the viewpoint of the Vinata, the Sutras and tantras, no justification for abortion exists: it is always described as a non-virtuous act. This is a very controversial thing to say. While there are scriptural references to suicide, those beings concerned were advanced bodhisattvas who, as well as being motivated by compassion, were at least on the Path of Seeing and had achieved direct insight into the nature of reality. From the scriptural perspective, it is only at this point where suicide can be virtuous: otherwise it is definitely not, and indeed becomes the cause of rebirth in the lowest hells. I say this because it is important that people are aware that compassion alone is not enough to ensure that suicide is virtuous; giving ones body to benefit others, as did the Buddha in a former life to a hungry tigress at Namo Buddha (http://www.rigpawiki.org/index.php?title=Namo_Buddha) must be accompanied by a proper experience of the view of emptiness. If one has not achieved the Path of Seeing, suicide is, from a Buddhist scriptural perspective, a non- virtous act and the cause of great suffering. Thank you for bringing up this discussion. Sadly I lack time and also I am not really in the mood to discuss this at the present point. Just briefly. Ethics are dependent arising. In general therefore killing, including committing suicide is a “natural negative deed” in Buddhism. Exceptions are for (advanced) Bodhisattvas and Arhats, and those exceptions are based on their realizations of emptiness and their motivation. To offer the body for a higher purpose can go into this direction but it is controversial due to the tricky subject matter. I think we have to accept that Tunden’s action is not really related to the self-immolations of Tibetans but rather to committing suicide and that both events should not be mixed. Why is suicide classified as a non-virtuous action in Buddhism? It states that in the early Buddhist scriptures there is no prohibition to commit suicide. The first case of a suicide attempt reported in the Theravadin texts at the time of the Buddha was an attempted suicide by jumping from a rock. This deed, however, killed another person and the Buddha forbid subsequently monks to jump from rocks. However, this trial to commit suicide and the action of having accidental killed another person was seen as a “minor fault” but not as a “Parajika” – which is the class of the heaviest misdeeds that lead to expulsion from the order. It’s all quite complex and not that easy to answer. De facto the object of the misdeed of killing is another person and not the own person. I cannot be sure of motives but I do know that every time it happens it sets an example for others to follow-looking at the horrific pictures it strikes me that there is enough hell on earth already a without being encouraged to add to itESPECIALLY WHEN NOBODY LISTENS -STOP SELF IMMOLATION NOW! I agree. The more the self-immolators are treated like heroes, the more it sets a wrong example. This is too much! When will the truth and power of Karma prevail? The fearless martyrs, you are grateful to us, really remarkable and honourable. But now it is too much. I urge the ever ready brave men and women to stop now. The best way to serve His Holiness the Dalai Lama is through staying alive rather than offering one’s soul to him through self-immolation. However, if one is dedicated and compelled to continue the self-immolation protest, then it is important is work out a military-like strategy. First, self-immolate on alternate days rather than consecutive days. Second, the timing is important. Third, the location is also crucial. Fourth, do not self-immolate in groups of three or four. Fifth, leave behind one’s written or recorded last wishes. Sixth, it is vital to ask near friends to take video and photos of the self-immolation. It is absolutely important to well plan and organise it. Slogans like “Freedom for Tibet”, “His Holiness the Dalai Lama’s Return to Tibet”, “Release of Political Prisoners” have become too common. It is very important to raise different slogans such as “His Holiness the Dalai Lama is Head of Tibet”, “Resume Sino-Tibetan Dialogue Soon”, “Tibet and Other Minority Nationalities Should be Granted Genuine Autonomy”, “Chinese People Need Real Democracy”, “Oppressed people of China, Rise Up Together”, “Global Community, Stand Up for Our Just Cause”. These slogans should be disseminated by printing on Lungta and spreading across passes and vales. Uprisings such as school and mass protests are extremely good. It is important to carry out protests on political, economic and religious matters through Sangsol, Prayer Services, Fasting, Discussions and speeches on Tibet issue, Petitions to the central government for minority rights. All these messages be announced to all. The complete appeal seems to be quite of a duplicity character. First he praises the self-immolators as “fearless martyrs” and “really remarkable and honourable”, then he asks them to “to stop now. The best way to serve His Holiness the Dalai Lama is through staying alive …” but then he suggests to those who are “dedicated and compelled to continue the self-immolation protest” to “work out a military-like strategy.” And then indeed he gives an instruction how to do that. So all in all what the Chinese source says has some substance in reality – though China bends it, and it’s a single voice and not that of the Dalai Lama. Also Thurman goes into the mode of herofying the deeds … he calls them “heroes” and the deeds an “extraordinary act of heroism”, “heroic activities”, he calls the self-immolators “military hero warriors”, even “heroes of non-violence” and thereby he “sub-consciously” [a term he uses in the beginning] encourages self-immolation. Not only this, he gives a religious distorted background when he claims “you immolate your anger, you immolate your suffering, you immolate your egotism in the fire of wisdom” etc. “one has to praise their heroism” – though it get more differentiated if one continues to listen. On the other hand to “condemn” the self-immolators, as Lineage holder expects, would be also wrong. However, in all ways, I think, they should be really urged to stop their actions. »Dalai Lama has issued guide book on immolations: China« quite wrong headline, the Dalai Lama hasn’t issued this, it is also no “Guidebook” however, these are indeed guidelines by a Tibetan, a former member of the TGI. Of course China spins the story to their own favour but this shouldn’t lead towards to have a blind eye on this appeal by Lhamo Je. There are social dynamics and many Tibetans seem to like this, therefore caution seems to be very important to not further fuel the situation and the self-immolations. While suicide per se is not prohibited by the Vinaya,(except under circumstances outlined above), it is nowhere condoned. The only references seem to be to where it is ‘blameless’ We can infer from this that, other than the circumstances outlined in the Vinaya, it IS worthy of blame and therefore a fault. John, why are you posting this here? This type of hostile Anti-Dalai Lama bashing doesn’t really fit to what this blog aims for … the only person who might find this true and useful is quite likely “Lineage holder”, and those who believe the official China agit-prop. In case there was any “The Self-immolation Guide” – which is highly unlikely they should give evidence / prove for it. Quite simple. It is to illustrate how, in the light of what we know the Dalai Lama has said on this issue, that there is a campaign promoting misinformation, unless it is proved otherwise? Note how the document to which they refer is not available for verification. It is useful to know what is being said, without proof, to expose the tactics of the rumour mongers. As far as Lineageholder is concerned, if he or she wishes to claim a truth here, then let them do it with evidence. However, he or she has not raised the topic. The title of this section is Why are Tibetans Turning to Self Immolation? If there is speculation out there as to why, it needs to be addressed. Tibetan writer and former member of Tibetan Parliament in exile Lhamo Kyap clarifies on China’s ill-founded criticism that he authored a ‘guidebook on Self-Immolation’ wherein the fact is Lhamo Kyap has in the past publicly appealed the Tibetans not to self-immolate and had hoped that it would end. Now people can judge for themselves based on evidence. There is much activity regarding immolation on the Internet today. The claim appears to be that the Immolation Guide is on the Internet. I cannot find it. …’Greater love has no one than this, that he lay down his life for his friends’. We have the Dalai Lama on the one hand not condoning the action of immolation but not condemning as it may be a problem for the relatives of the immolator. The advice given, once the decision to self immolate has been made, although given by one man, may give the individual some sort of encouragement to go through with the act. That this document exists is enough for the opponents of the Dalai Lama to spread more unrest. So, this ‘man in the street’ would urge the Dalai Lama to give a firm statement regarding this matter. It would mean no disrespect to those who have made the sacrifice but would demonstrate to the world the depth of compassion for living beings. Yes, it would be very good to start a campaign which stops the self-immolations without belittling those who have already burned themselves. Thank you John. I think it is important to approach this all from different perspectives and not to accept just Tibetan views. Et par le Dalaï-lama ? Lors de la grève de la faim de Thubten Ngödrupen 1998, le Dalaï-lama avait exprimé son désaccord avec ce genre de pratiques, qu’il considère comme une violence contre soi. Cependant, il cite beaucoup Gandhi, pour qui la grève de la faim était un acte non violent. Il a exprimé son admiration pour le courage de ces gens et des prières ont été organisées. Mais il a mis en doute l’efficacité de telles actions qui, selon lui, entraînent une répression accrue. Désormais, il ne veut plus répondre à ce sujet. Im Fall von Thubten Ngodrup während des Hungerstreiks 1998 hat der Dalai Lama seinen Unmut gegenüber solchen Praktiken ausgedrückt, die er als einen gegen sich selbst gerichteten Gewaltakt ansah. Andererseits zitiert der Dalai Lama häufig Mahatma Gandhi, für den der Hungerstreik ein gewaltloser Akt war. Er hat seine Bewunderung für den Mut dieser Menschen geäußert und an Gebeten teilgenommen. Aber er hat die Effizienz solcher Aktionen in Frage gestellt, die, wie er meint, nur noch stärkere Repressionen nach sich ziehen. Er will sich künftig nicht mehr zu diesem Thema äußern. During the hunger strike of Thubten Ngödrup in 1998, the Dalai Lama expressed his disagreement with this kind of practice, he considers this as violence against oneself. However, he cites often Gandhi, for whom hunger strike was a non-violent act. He expressed his admiration for the courage of these people and attended prayers for them. But he questioned the effectiveness of such actions, he said, [these actions] lead to increased repression. Now he does not want to say anything about this [topic] any more. The question is, what are the reasons, he decided now to remain silent? If anyone has ‘good’ reasons for doing something, how will we know unless we are told what they are? To be silent on the basis that anything said would be misunderstood is understandable but the opposite is also true. Silence is open to interpretation. and being silent can be just the right action of a wise person. I utter agree. Also with respect to Bob Thurman. QUESTION: Tibetans are again still asking for more freedom and human rights. And one after another, almost every day, one Tibetan putting themself on fire and now it’s expanding to even Kathmandu in Nepal. So anybody will talking to the Chinese? What’s the future of the Tibetans now if this continues the trend among Tibetans? MR. VENTRELL: Yeah. Thank, Goyal. We remain concerned by the deteriorating human rights situation in Tibetan areas, including the numerous tragic self-immolations that have occurred and related reports of detentions and arrests. We’ve also seen, as you mentioned, in Nepal, self-immolations. We continue to call on the Chinese Government to permit Tibetans to express grievances freely, publicly, peacefully, and without fear of retribution. And we urge Tibetans to end self-immolations. Baroness Warsi stated that the UK remains deeply concerned about the large number of self-immolations in Tibet and regularly raises concerns with the Chinese authorities and continues to encourage for resumption of substantive dialogue as a means to address the Tibetan concerns and to relieve tensions. The reason [for all the self-immolations] lies in China’s massive policy failure in Tibet over the course of more than 60 years of its rule. The revolution that is brewing in Tibet is driven by political repression, cultural assimilation, social discrimination, economic marginalization and environmental destruction.